DON NARY was born in Pittsburgh, PA, moving to Long Island, New York during the third grade. In NY, Don attended the South Huntington Public schools until his senior year in high school when he was admitted to the <?xml:namespace prefix = st1 ns = ""urn:schemas-microsoft-com:office:smarttags"" /> New Hampton Prep School in New Hampton, NH. Upon graduation from New Hampton, Don attended New England College, the University of New Hampshire, Granite State College and the Massachusetts school of Law . While attending New England College , Don became a Resident Assistant through the college's Dean of Students & Residential Life office and was trained in peer counseling. This exposure to the counseling field fostered a lifelong interest in counseling and psychology with Don working in the counseling field as a case manger and counselor in the community, adolescent and family mental health areas for 15 years prior to attending law school. While attending law school Don looked to his friend George Wattendorf, then Dover, NH Prosecutor and City Attorney, for mentoring and legal experience. 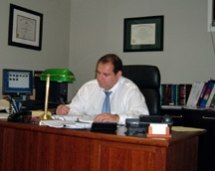 George, the Dover Police Department and the City of Dover , generously allowed Don to clerk and prosecute cases for over three years. Additionally, Don did and extensive internship in MA & NH criminal defense and motor vehicle litigation through the Law Office of Attorney Mark Stevens. Don brings his eclectic background, compassion, determination and versatility to every case and every client he represents, with a strong interest in Domestic relations, civil litigation, and certain criminal matters.